Astral People and Handsome Tours are pleased to announce the debut Australian & New Zealand tour of Chicago rapper and producer Saba. The West Chicago native gained widespread recognition in 2015 after his performance alongside Chance The Rapper on The Late Show With Stephen Colbert. The pair performed Chance's 'Angels', their collaborative effort which featured on vocals. This wasn't the first collaboration between the two, with Saba featuring on Chance's track "Everybody's Something" from his Acid Rap mixtape in 2013. Returning the favour, Chance recently featured on 'LOGOUT', a standout cut on Saba's critically acclaimed sophomore album - CARE FOR ME. Featuring standout singles 'LIFE', 'LOGOUT' & 'CALLIGRAPHY', CARE FOR ME has earned high critical praise, being named Best New Music by Pitchfork & landing the artist an interview and performance on Soulection Radio. CARE FOR ME, Saba's second album, comes as an ode to his late cousin and best friend Walter Long Jr., who performed as John Walt. Long was fatally stabbed coming off a CTA train in Chicago in February 2017. Last year, as documented in a feature story by NPR, Saba delivered emotional performances on tours spanning North America and Europe in support of his critically-acclaimed 2016 release Bucket List Project, which Rolling Stone named one of the Best Rap Albums of the year. Proclaiming Long's birthday, Nov 25th, John Walt Day, Saba concluded 2017 with a sold-out hometown concert where all proceeds went to the John Walt Foundation, which he had launched earlier in the year alongside Long's mother to generate funds for local youth with interest in the arts. Following these heart felt performances, Saba took a three month long hiatus, a time spent focusing his energy on creating new music. Working alongside producers Daoud and daedaePIVOT, Saba hones in on social anxiety and relationships with family and God as the linchpins of his new album, CARE FOR ME. 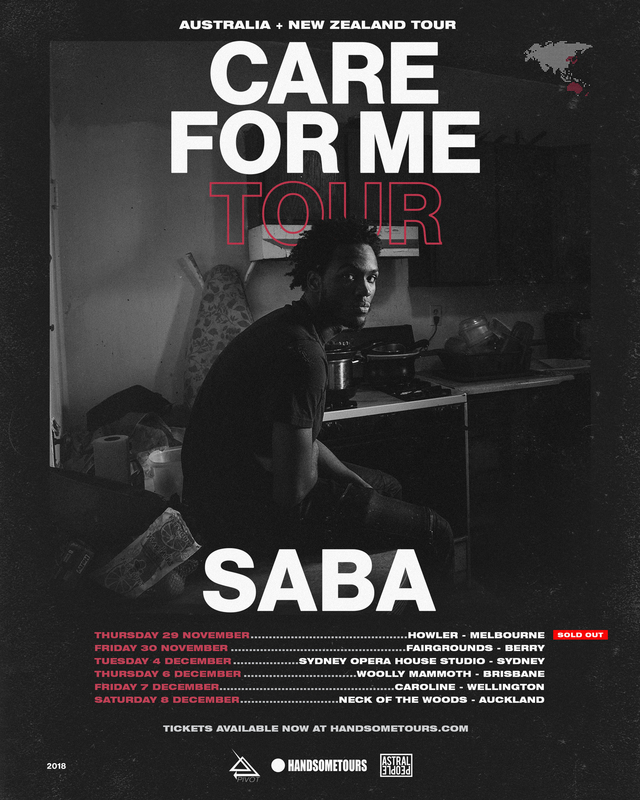 Experience CARE FOR ME live at Saba's first ever Australia & New Zealand tour. With dates spanning across November and December, this is a tour you really don't want to miss.